STAMFORD — For the 14th consecutive year, the state football playoffs will include New Canaan, as the Rams knocked off the top-ranked Darien Blue Wave, 17-14, in the annual Turkey Bowl game Thanksgiving morning at Stamford’s Boyle Stadium. Quarterback Drew Pyne hit receiver Wyatt Wilson over the middle for a 16-yard touchdown to put the Rams ahead for good with 6:58 remaining. Darien had a shot to tie it in the final minute, but Will Kirby’s 32-yard field goal attempt was off the mark with 30 seconds to play. It’s the second straight Turkey Bowl win for New Canaan, but more importantly for the Rams, they get to keep playing football. New Canaan (8-2) is the No. 8 seed in Class LL and will play at No. 1 Shelton (10-0) in the state quarterfinals on Tuesday, Nov. 27. Darien (9-1) — No. 1 in the GameTime CT poll — suffered it first loss and dropped from third to sixth in Class LL. The No. 6 Wave will play at either Newtown or Greenwich (both 10-0) in Tuesday’s quarterfinals. Their opponent will be determined by the outcome of Friday’s Norwalk-McMahon game. If Norwalk wins, the Wave play Newtown. If McMahon wins, they face Greenwich. New Canaan had taken some heat this season due to its lack of success against elite opponents. They carried a four-game win streak into Thanksgiving, but their early-season losses to St. Joseph (No. 5) and Greenwich (No. 2) still loomed large. Darien’s loss was its first of the season and they are now 46-2 over the past four seasons with the only two defeats coming in the last two Turkey Bowls. This time around, turnovers were the biggest issue, as the Wave lost the ball on three interceptions — two to Charlie Cunney and one to Drew Guida — and a fumble. The game actually turned on a pair of fumbles in the fourth quarter — both of which went New Canaan’s way. With the Wave leading 14-7, New Canaan running back J.R. Moore broke free for a 10-yard run, but had the ball jarred loose on a tackle by Darien linebacker Sam Wilson. The Wave’s Will Bothwell came out of the pile with the ball, but after a conference, the referees gave possession to New Canaan. The Darien defense kept the Rams out of the end zone, but kicker Nicholas Radman booted a 28-yard field goal to close the gap to 14-10 with 9:47 remaining. On the ensuing drive, New Canaan’s Harrison Skyrm sacked Wave quarterback Cooper Hancock forcing a fumble. Kieran Buck scooped it up and returned it to the Blue Wave 20-yard line. Two plays later, Pyne found a wide open Wilson for the go-ahead touchdown with 6:58 remaining. 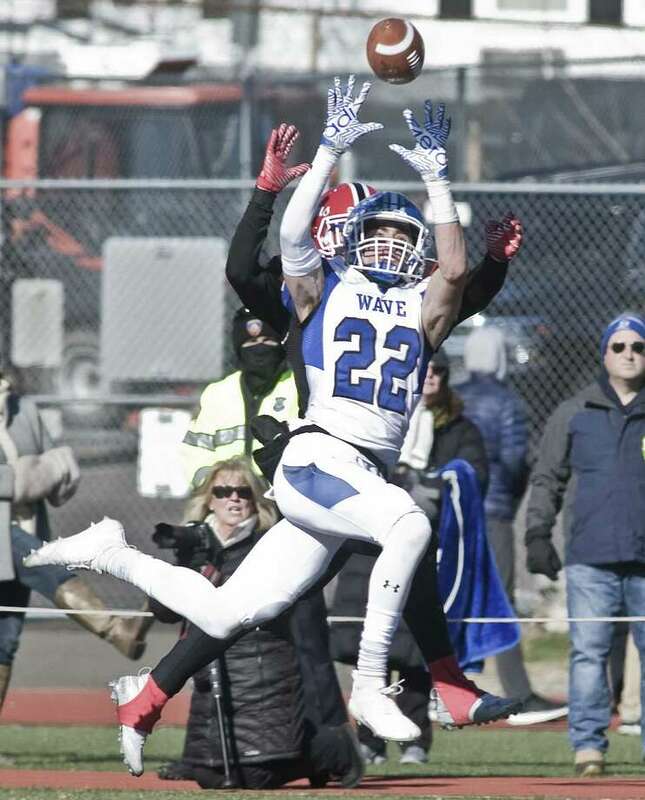 Darien’s next possession went nowhere, but on the Wave’s final drive, Hancock hooked up with receiver T.J. Cornacchia for a 50-yard pass play to the New Canaan 20-yard line. Hancock then hit Herget for 10 yards and a first down at the Rams’ 10 with one minute on the clock. New Canaan’s defense stepped up one last time, however, and the game eventually ended when Kirby’s field goal attempt went wide. New Canaan now has a 52-38-2 advantage in the 91-year history of the rivalry, and is 15-9-1 in Turkey Bowls, which began in 1994. Jack Stewart, New Canaan. The senior co-captain earned New Canaan’s Jack Dempsey MVP Award, named for the former Ram and Turkey Bowl MVP. Dempsey was a corporal in the U.S. Marine Corps who was killed in action in Iraq in 2004. Stewart led a huge defensive performance for the Rams, who kept the pressure on Blue Wave QB Cooper Hancock. Tyler Herget was named Darien’s MVP.